Though several different plants are called by this name, true wintergreen is Gaultheria procumbens, a lowgrowing species of shrub common in sandy coastal regions and woodlands of eastern North America from Georgia to New Foundland. It is a member of the heath, or Ericaceae, family. Other names by which wintergreen is known include aromatic wintergreen, boxberry, Canada tea, checkerberry, deerberry, ground berry, mountain tea, partidgeberry, spice berry, teaberry, and wax cluster. Wintergreen plants have creeping underground stems from which small reddish stalks grow, normally less than 6 in (15 cm) high. Wintergreen leaves are spoon-shaped and less than 0.5 in (1 cm) in length. They are bright green, shiny, and have a leathery appearance. They are attached in tufts near the tip of a rigid, slender stalk. 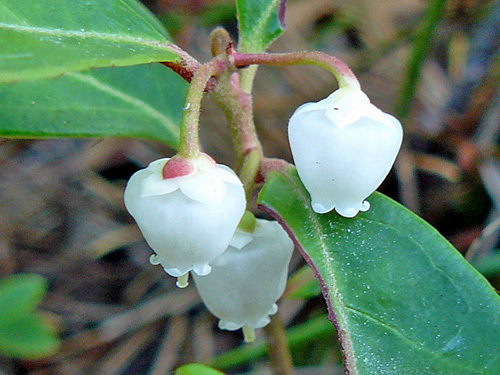 In June or July, wintergreen plants produce tiny wax-like, urn-shaped flowers, which are either white or pink in color. These unusual flowers are often difficult to find because the plant’s leaves and other ground covers on the forest floor hide them so well. The fruit of the wintergreen, a startlingly brilliant red berry, appears in late autumn through the winter, and is much more visible than the wintergreen flower. 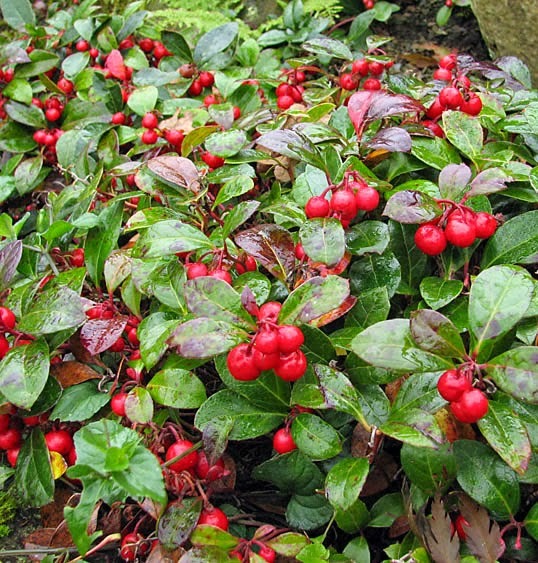 Wintergreen is an evergreen plant, and even beneath deep snow it retains its shiny green leaves and scarlet berries. Wintergreen leaves and berries are edible. In their natural state they have no particularly noticeable odor. The leaves have a tart, spicy, astringent taste, while the berries are sweet, with a unique, pleasant taste, which is often used in flavorings. Wintergreen leaves were formerly carried in the United States Pharmacopoeia,but now only the oil distilled from them is listed. But in many countries the whole plant is still used. When wintergreen leaves are distilled, they impart an oil, which is made up of 99% methyl salicylate, the chemical compound upon which all aspirin products are based. Before being distilled, wintergreen leaves have to be steeped in water for nearly a day before the oil will develop through fermentation. It is only after this fermentation and the chemical reaction of water and one component, gaultherin, that wintergreen emits its characteristic, pleasant aroma. Chemists have learned how to synthetically produce an oil with many of the same properties and a very similar product, also called oil of wintergreen, is extracted from the sweet birch tree, Betula lenta. Gaultheria hispidula is also called wintergreen. It is supposed to remove the predisposition to cancer from the body. 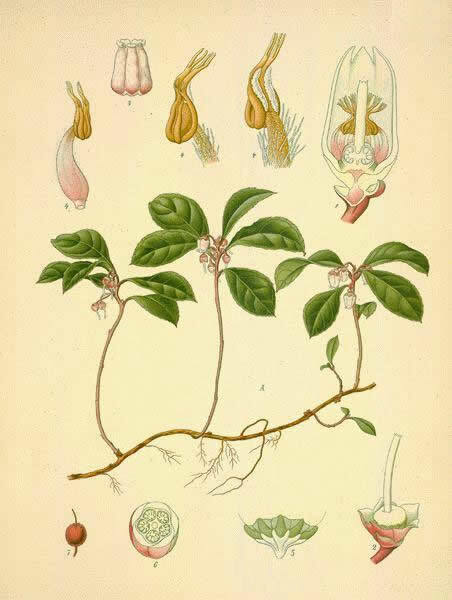 Gaultheria shallon, sallol, is found in northwest America. Its berries are edible and quite tasty. Pytola rotundiflora is also known as false wintergreen or British wintergreen. It was formerly used as a vulnerary. Chimophila umbellata and Maculata are both called by a variety of names: bitter wintergreen, rheumatism weed, spotted wintergreen, or pipsissewa. North American natives used these two herbs for the treatment of indigestion, rheumatism, scrofula, and as a diuretic. Trientalis europaea, or chickweed wintergreen, is native to England and was used in the past externally in an ointment used in healing wounds, and internally as a tea to treat blood-poisoning and eczema. Wintergreen oil is used as flavoring for candies, chewing gum, and medicines. With eucalyptus or menthol, it is often used to flavor toothpaste and other dental products. The berry, often called checkerberry, is used for flavoring candies. It is sometimes used as a tea by itself, or combined with tea as a flavoring; hence its name teaberry. Medicinally, wintergreen leaves are taken internally as a decoction to treat nephritis and bladder problems. It is used as a diuretic, for the treatment of neuralgia, as a systemic tonic, to stimulate menses, and to aid in bringing on lactation after childbirth. It has also been used to relieve children’s headaches. Leaves have also been used for headaches and other pains, and as a gargle for a sore throat and mouth. Externally, oil of wintergreen is widely used in liniments for the relief of muscular-skeletal pain, both from sports injuries and arthritis. Because of its aromatic and pain-relieving qualities, the oil is used in a number of products in aromatherapy, including stress-reducing pulse point creams, foot scrubs, and balms. Wintergreen leaves can actually be picked at any time of year, but summer is the most opportune time for gathering them. They must be dried in the shade to prevent loss of the volatile oil contained in the leaves, and should be stored in an airtight container in a dark, cool place. A decoction can be made by mixing 1 c (240 ml) of boiling water with 1 tsp (1.5 g) of the dried wintergreen leaves and allowing the mixture to steep for 15 minutes. This tea may be taken up to three times per day. Oil of wintergreen, as noted previously, is made by first steeping wintergreen leaves in water for at least 24 hours, and then allowing this mixture to ferment and release its oil. Fermentation is known to have occurred when the characteristic wintergreen aroma is released. This oil is sometimes used externally in dilute solutions in combination with other products such as aloe and lanolin to produce ointments, but either the oil extracted from sweet birch or the synthetic version are more apt to be used. Oil of wintergreen should not be taken internally. In the past, it has been given in a capsule form to treat rheumatism, but excessive doses of it have actually caused death due to severe inflammation of the stomach and gastrointestinal hemorrhage. True oil of wintergreen, distilled from wintergreen leaves, is very rapidly absorbed by the skin and often causes severe skin irritation and painful, hive-like skin eruptions.